Read and write words that end with -op. 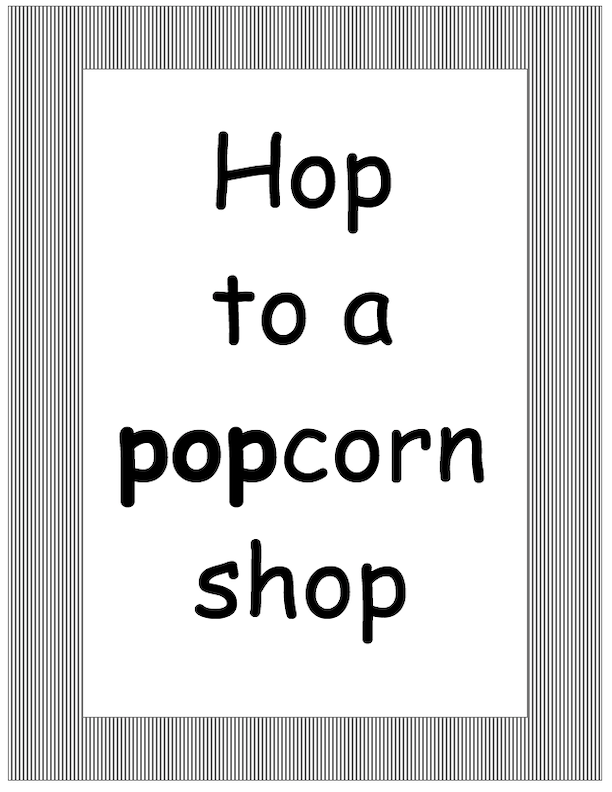 Tell the children that they will hop to a popcorn shop and read and write words that end in -op, such as pop, stop, hop, and top. Before the activity, place the shop signs (Mop Shop, Top Shop, Popcorn Shop) at stations around the room and set up the Popcorn Shop with a pretend or real popcorn popper. Help the children read the written direction to "Hop to a popcorn shop" (see below) and explain that they will hop to find a shop that will pop popcorn. Give the children a popcorn box (or cone) with a few real or pretend popcorn kernels. As the children hop to find a popcorn shop, invite them to chant, "Hop, hop, hop to a popcorn shop!" 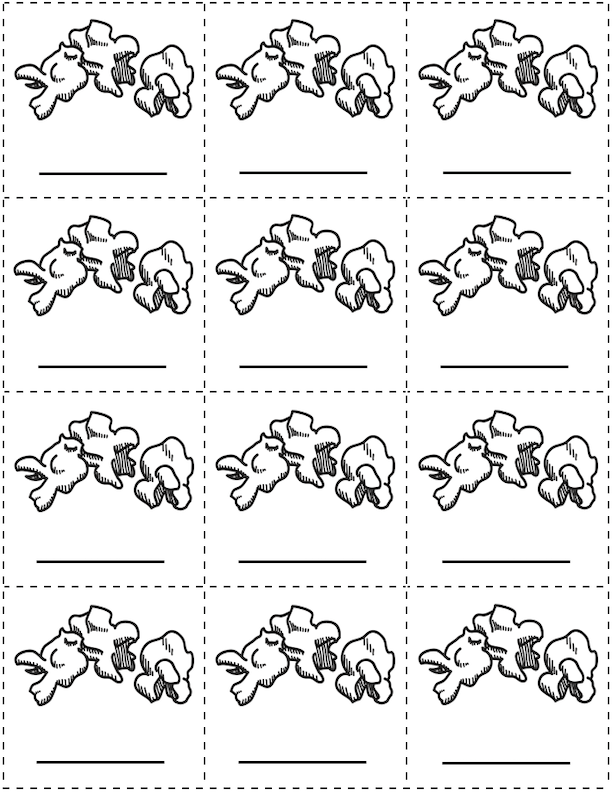 Comment on how the popcorn kernels hop as the children hop. Tell the children to put a top (a lid or hand) over the popcorn container so the kernels won't hop out. Have the children hop to the Top Shop and then to the Mop Shop and stop to read the shop signs (see below). Ask the children if they think the Top Shop or Mop Shop would sell and pop popcorn. When the children can't buy popcorn at a shop, encourage them to hop to the next shop as they chant, "Hop, hop, hop to a popcorn shop!" When the children reach the Popcorn Shop, have them read the sign and exclaim, "Stop! Stop! Stop! We're at the Popcorn Shop!" Have the children plop down in the area that is set up as the Popcorn Shop. If using a hot air popper, let the children drop a few kernels in the popper before you turn it on and encourage the children to say, "pop!" each time they see popcorn pop. If cooking microwave popcorn, let the children hop and say, "pop!" as they hear the popcorn pop. If pretending to pop popcorn, let the children drop a few kernels into the pot, cover with a lid, jiggle the pot to make the pretend popcorn hop and 'pop,' and invite the children to hop and say, "pop!" Help the children fill their popcorn boxes with real or pretend popcorn until you say "stop!" Have the children make a 'top' for the box with their hand or a piece of paper. Comment on how the top will keep the popcorn from hopping out. Let the children hop back to a designated spot. Let the children make different -op words by changing either of the consonants or the vowel. For each of the words the children make, have them state the individual sounds they hear and then blend those sounds back into the word. Engage the children in reading the text simultaneously with you. Read the text with the children again but fade support. Have the children underline and read the words in the text that end in -op. Have children use the app to pop virtual popcorn and read and build -op words. 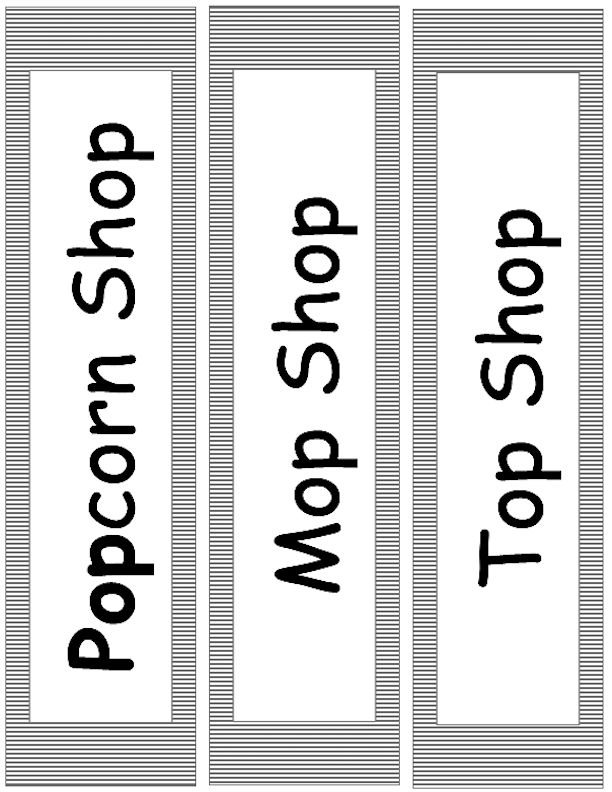 Review the -op words used in the activity (i.e., hop, pop, stop, shop, top, mop) and then help the children write the words on paper or on the popcorn graphics (see below). Provide a word wall with the target -op words listed and ask the children to use these words to write about how they got to hop to shops and pop popcorn. Let's hop to a popcorn shop. Hop, hop, hop to the shop. See the popcorn kernels hop. Stop at the popcorn shop. Pop the popcorn at the shop. Fill the popcorn box to the top. Hop, hop, hop with a lid on top. Invite your child to hop to the popcorn shop (kitchen) with you to pop some popcorn. Put a few kernels of popcorn in a cup for your child to carry while he or she hops to the popcorn shop. Help your child drop the popcorn kernels into an unheated hot air popper then start the popper or pop microwave popcorn. If popping real popcorn, have your child watch it pop and say "pop" as the popcorn pops. If pretending, put kernels in a pot, cover the pot with a lid, and shake the pot while your child hops in place or on bubble wrap and says "pop!" Eat (or pretend to eat) popcorn as you take turns thinking of words that end in -op (e.g., pop, stop, hop). 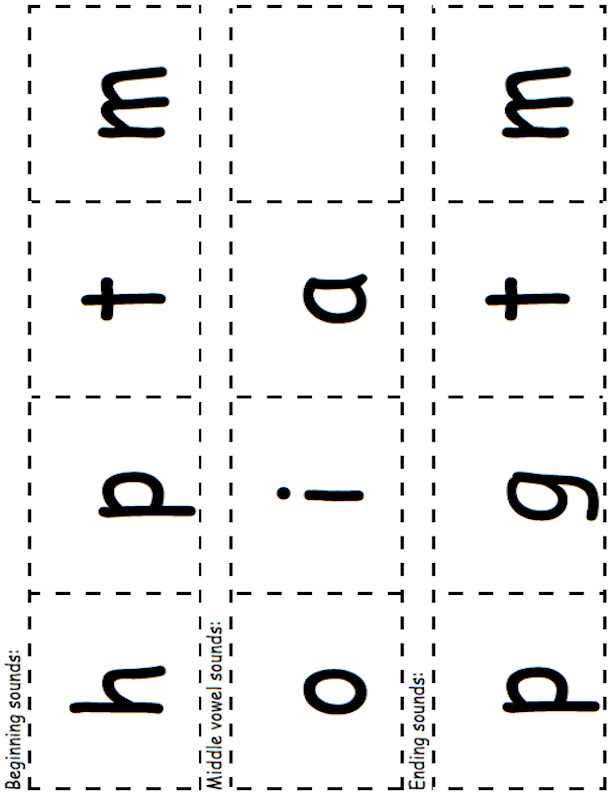 Using letter cards (see below), invite your child to build and read -op words with you and independently. 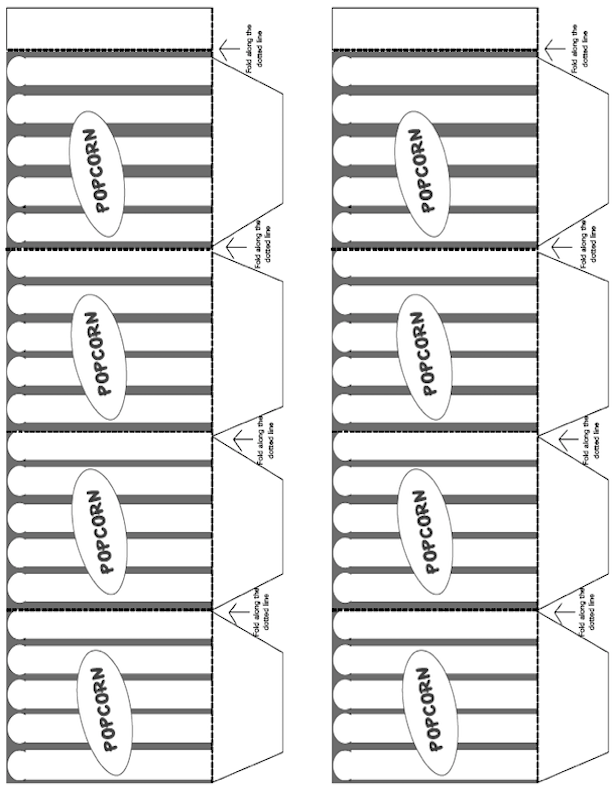 Help your child write the words they created on the popcorn graphics (see below). CCSS.ELA-LITERACY.RF.K.3.B: Associate the long and short sounds with the common spellings (graphemes) for the five major vowels.